The following link gives the site pictures of the identified property in Namandi Village near Cheyyar in Kanchipuram district in which Guru Rayar has willed for his mrithika Brindavanam to come up. These pictures were taken on 01-Sep-09 before any construction activity was started on the site. This set of pictures has been taken after the completion of the compound wall construction for a basic height of 2 1/2 feet. The first picture has been taken from the south west corner of the property and going towards to the eastern side. Today was Sunday, December 06, 2009 (Karthiga month, Ravivar) – a very auspicious day for Sri Lakshmi Narasimmar. It looks like that the initial seeds in this property has to be planted on this auspicious day. In the morning today, we went to the place with all the small plants and seedlings to plant the various trees – coconut, mango and various flower plants – in the proposed property which once grown can be potentially used for the various requirements in the brindavanam temple later. These have been planted in various locations of the property in a distributed manner throughout. The artha mandapam and the main vimanam would like as in the following URL. 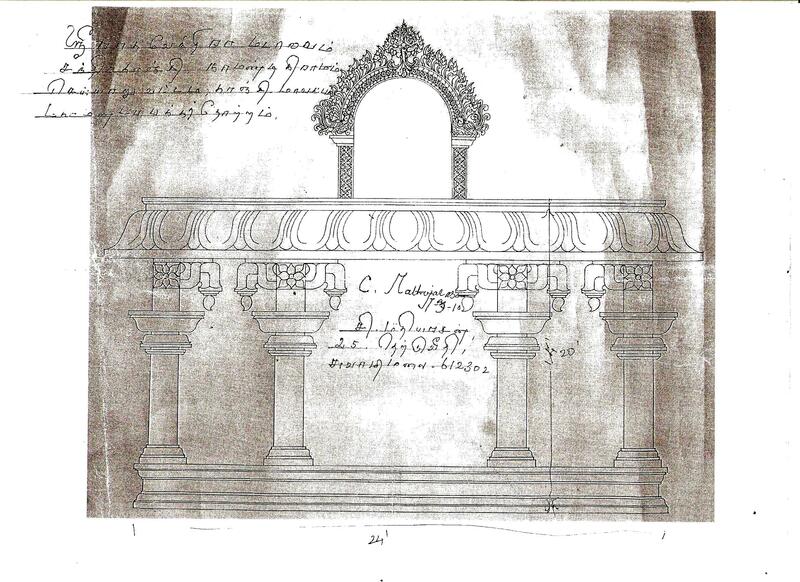 The left hand side part of this scanned picture gives a side view of the sanctum sanctorum and the ‘artha mandapam’. 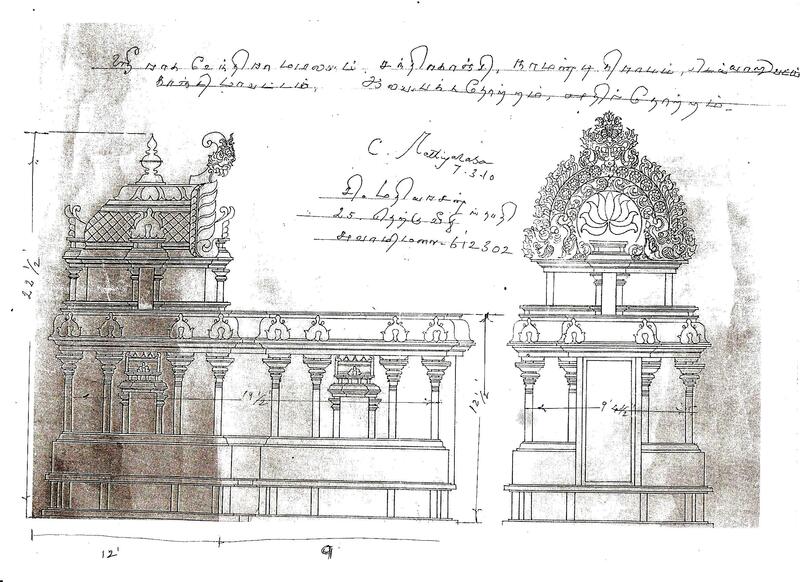 The right hand side of the scanned picture shows the front view of the gaja prashta vimanam that is the planned vimanam for the main sannidhi. Today the problem with the electric motor not working with the previously dug bore well in the project site has been successfully resolved by HIS grace…. By the grace of Sri Hari, Vayu and Guru Rayar, it has been decided that the initial construction to start in the place on the auspicious day of 13-Sep-2010 (Monday). We request all devotees of Sri Hari, Vayu and Guru Rayar to participate in this divine activity in what ever way they can contribute and thereby seek their blessings. By HIS grace, since all the developments have been completing successfully till now in this project, we hope and pray to HIM to continue showering HiS grace continuously for the successful completion of this project. The original date for vastu puja which was for 13-Sep-2010 out of a sudden turn of events has got advanced to 22-Aug-10 (Sunday). That day was a very big muhurat day and also a vastu day – special significance for starting the construction activities. As always, we pray for HIS guidance and support not only for the success of this event but also for the overall successful completion of this project. We would also like to invite all devotees to come and grace this occasion. Due to an unfortunate development of the expiry of my father, we were not able to concentrate on the development of this construction site the last few months. By the grace of Sri Hari, Vayu and Sri Guru Rayaru, we propose to re-start the work slowly over the next week in this site to take this to completion. For further updates, you can visit the site: http://gururayar.blogspot.com for the latest updates. Sri Lakshmi Nrsimha Para Brahmane Namaha! Sri Lakshmi Nrsimha Para Brahmane Namaha! Sri Hanumathe Namaha! Sincere apologies for the lack of progress updates for the last couple of months. It is not like Rayar has stopped his guidance but owing to a lot of factors beyond our control, have not been able to keep giving updates on the progress. 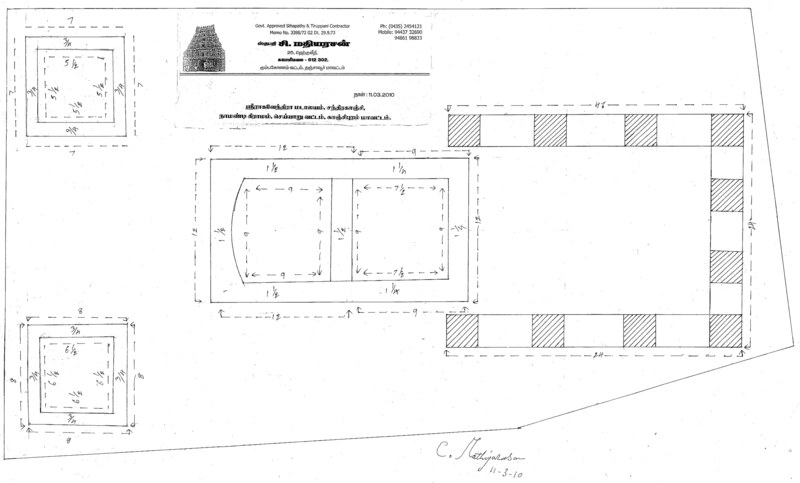 The next plan is to start the construction of the main temple including the main sanctum sanctorum, artha mandapam and maha mandapam above the current foundation that has been laid out. We plan to start this after around 5-6 weeks by which time our father’s abdik would be getting over as well as to get a sufficient corpus collected for this. Please pass along the message to all people whom you think might be interested in participating towards the construction of main sanctum sanctorum. 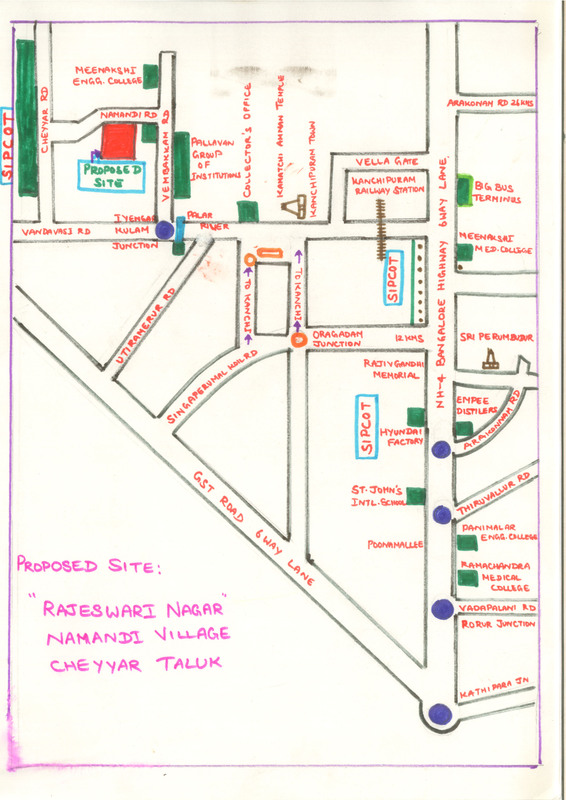 There are land plots that are available in and around the site in which this brindavanam is coming up for Guru Raghavendrar. 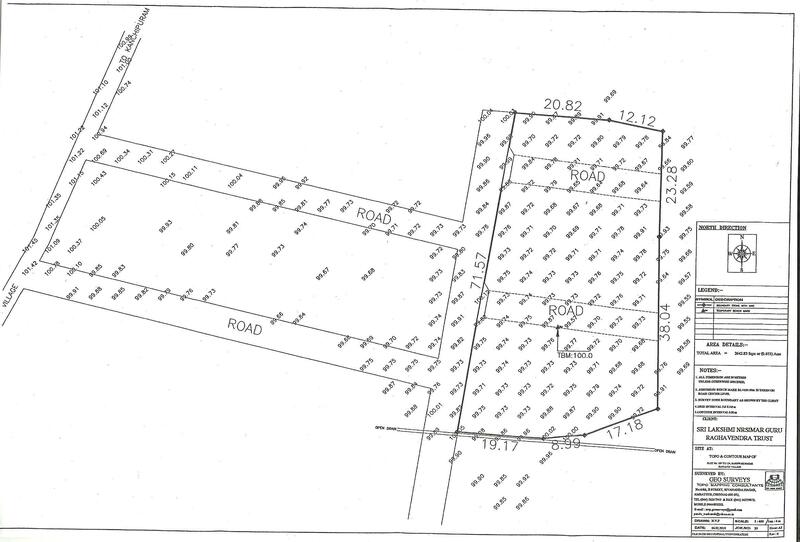 The promoter of this land has graciously accepted to donate a proceeds of the sale to the construction activity. This will be a double bonus to all devotees – to make an investment that has great appreciation potential as well as get a mental satisfaction of having contributed towards the construction of this temple for Rayar. Interested people can get in touch with vasan.vs at gmail dot com for further details.